When you walk by the bland patch of grass where Baltimore’s McKeldin Fountain once stood, do you get a pang and wish you could rekindle its splashy spirit of public protest, free speech and Brutalist architecture? If so, you’re in luck – there’s an app for that! 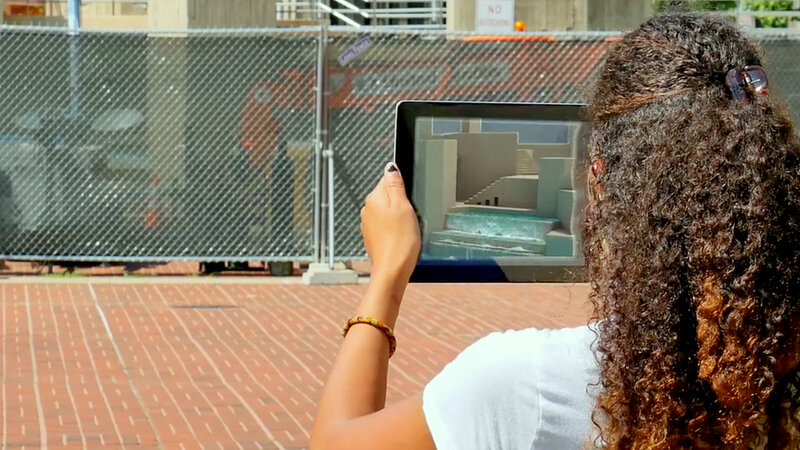 Artist Lisa Moren has crafted an “augmented reality” app that lets you bring the now-demolished landmark at the Inner Harbor back to life. You just need to go to the intersection of Pratt and Light streets (where the multi-tiered concrete water feature once stood) and hold up your phone or tablet like a protest sign. The soulless space before you falls away and. . .
Up will pop three-dimensional images of the cascading water and of the people who flocked to the plaza in front of it, McKeldin Square. People like artists, rappers, an ACLU lawyer, activists like the Women in Black peace demonstrators, the 2011 Occupy Baltimore campers and Black Lives Matter. There are colorful koi fish swimming and regular folks just enjoying the refreshing water. “We hope that Baltimore will own this as a 21st century monument to everyday people,” said Moren, who led the project to create the NONUMENT 01 app and spoke with Technically Baltimore about it. NONUMENT 01 is meant to highlight the role of the fountain and plaza as a public space – and to chronicle its 2016 destruction, driven by the Downtown Partnership and other civic leaders. 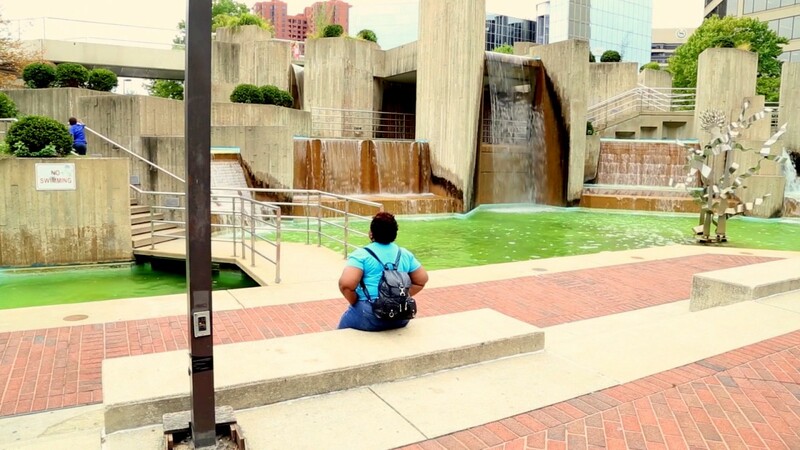 Preservationists fought to save the fountain and plaza, which was built in 1982 and included skywalks across Light Street leading to the Inner Harbor. But demolition was unstoppable. Moren, a professor of visual arts at UMBC, is kicking off the project tomorrow (Saturday, May 19). There will be a formal launch of the app from 1 – 4 p.m. at McKeldin Square. Among the features of the free event will be a performance by rapper DDM, Otakon cosplay, a 3D Sound Score by Erik Spangler, members of the Women in Black group and other special guests. Then, from 5 – 8 p.m., there will be an art exhibition on the fifth floor of nearby Maryland Art Place (218 West Saratoga Street). The exhibit will feature video installations and a live concert by Eze Jackson and Erik Spangler. Organizers promise a 3D printed model of McKeldin Fountain and a Virtual Reality headset that will allow you to experience the demolition first hand.